No more rushing back to your desk to answer calls. The Plantronics APA-23 Electronic Hook Switch module enables wireless headset users, who have Alcatel telephones, to place or receive calls without the need to lift your handset. This eliminates the need for a mechanical device such as the Plantronics HL10 handset lifter. The APA-23 (part number 38908-11) is compatible with the Plantronics CS500 series and SAVI series of wireless headsets including CS510, CS520, CS540, W710, W720, W730, W740 and W745. 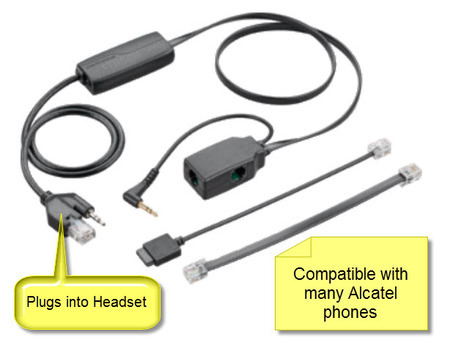 For earlier model Plantronics headsets please see the APA-2 EHS Cable. Go to Settings > Phone> Jack plug > Headset on the phone.